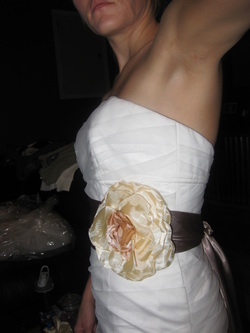 Very shortly after we decided to get married before the cruise that was to happen in 2011, I decided to buy a dress! Darin and I had been looking on preowned dress sites for a little while (because we're crazy and were bored), and I fell in love with one. I sneakily showed it to Darin, she loved it, so I snagged it! We had it delivered to our friend Tyler's house since we were still living with my parents. Tyler still had no clue what it was until a couple of months ago! Side note: We were so nervous of what was going to happen with the dress when we moved, so Darin and Mike came and got the dress and kept it at their house until the move was complete! I finally got the dress home and had to try it on by myself (difficult to zip up!) and take self-portraits in our armoires because at this point not one soul knew! It was hard, but it was so exciting! After learning more about our wedding, and that we wouldn't have a place to change before the ceremony, the more I got hesitant with wearing a traditional gown. I wasn't sure how I was going to be able to last the 1.5 hour car ride in the dress, and I could only imagine how silly I'd feel in a restaurant, at 1:00 pm in the afternoon in a wedding gown, eating some grub with strangers. 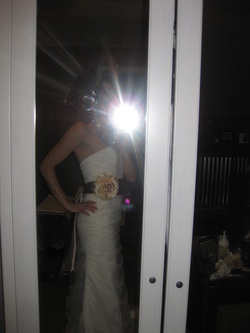 I just didn't feel like that dress matched the whole eloping thing. Enter Dress Number 2! Chris actually picked this one out. It is definitely "me" and we got it online at American Eagle. I hate brick and mortar stores; I'll shop online over going to the mall any day! Please don't mind the grease ball hair and face. I decided it was primetime to try on some dresses fresh out of Body Pump. Genius idea! Third time's a charm? Maybe! So when we both decided that a sundress would better suit our theme, we took to the world wide web! Well, I did, and then e-mailed Chris links! He and I (and Darin!) all fell in love with some gorgeous Lilly Pulitzer dresses. But, they were a bit out of our price range. Bummer! This is actually why we choose Dress Number 2! Enter Rue La La. Have you heard of this site? Well, they have new boutiques every day of different brands and their prices are ridiculous. In a good way. One day I was about to delete the e-mail when I saw that my beloved Lilly was going to be on RLL the following day. I was so excited!! So which one will it be? I'm not sure; it will definitely be a game-time decision! Plus, you already know by now because I'm thinking there will be a picture of us on D day on your invites! !